It's semi-final Saturday in the NFL..or at least that's what I'd call it. I'm never sure what to call the NFL's second round. 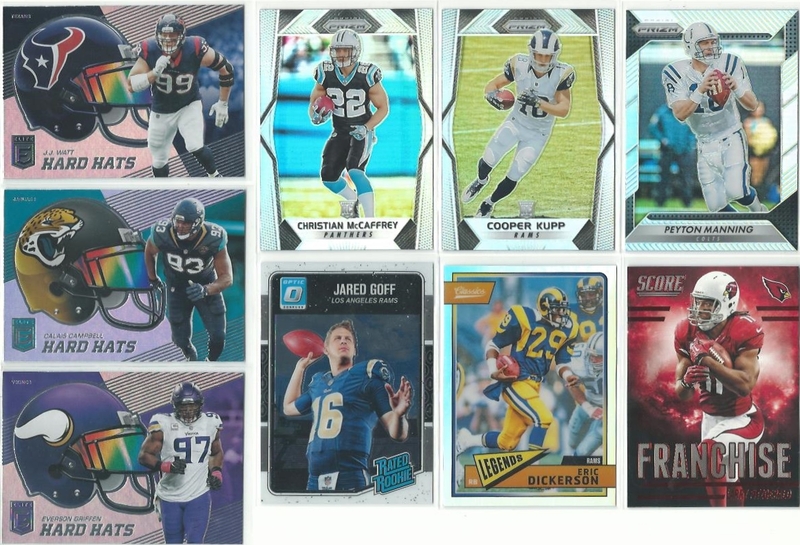 My COMC haul from their post-Christmas 'bonus' sale showed up at my door yesterday (along with a surprise package from Julie - which I'll discuss another day) so I thought I'd show off the latest additions to my football card collection. This was the first card I bought during the sale, and possibly my favorite purchase. I'm a huge fan of Panini Immaculate, specifically these Immaculate Numbers memorabilia relics. 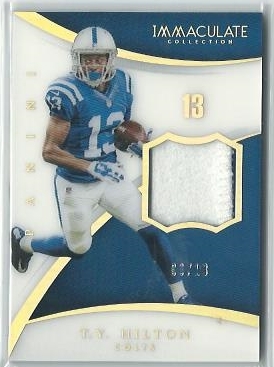 The print runs are limited to each player's uniform number, which means there are only 13 copies of Colts receiver T.Y. Hilton. Hilton isn't as big of a name as Antonio Brown or Odell Beckham, and this isn't the most interesting patch swatch. That might explain why I was able to snag this beauty for just $4.52. 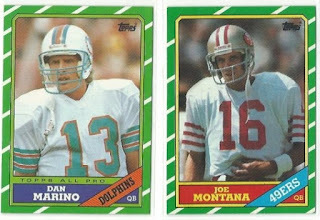 I also picked out a pair of legendary quarterbacks for my 1986 Topps set build. Paid $1.15 for the Marino and $1.45 for Montana. They are both in ideal shape - minimal (if any) corner wear and well centered. I'm now at 52.3% of this set, thanks in large part to TCDB trades. 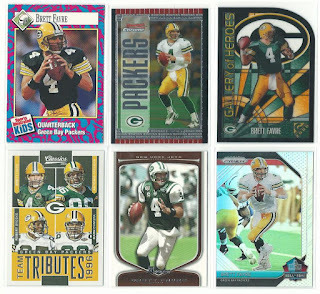 Here's six of the seven Brett Favre cards I added to my COMC cart (forgot to scan the other one) I thought I had at least 700 in my collection, but even with these new additions (plus an extra froma TCDB trade) I'm only at 676. It's already looking unlikely that I'll reach my New Year's goal of 1,000 different Favre cards by 2020. Helmet logos have always appealed to me, which is why I made a point to pick up some Hard Hats inserts from this year's Panini Elite. Dickerson, McCaffrey, and Manning are guys I collect - and the Goff Optic was a failed flip at $1.45. I'm happy to keep it, especially if he leads the Rams to a Super Bowl victory..
..with help from workhorse running back Todd Gurley, of course. The rookie-year Prizm helmet cost $3.34. I paid more for this Ryan Tannehill Impeccable base card ($1.15) than the Big Ben base card I bought last year ($1.00) that led me to seek out these singles. 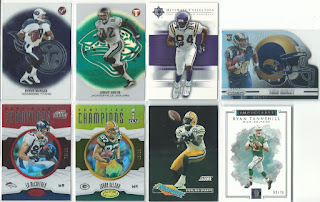 It was an inexcusable oversight that I did not have a Sterling Sharpe Franchise insert. $1.65 was a reasonable price to pay for filling this hole in my Packers collection. 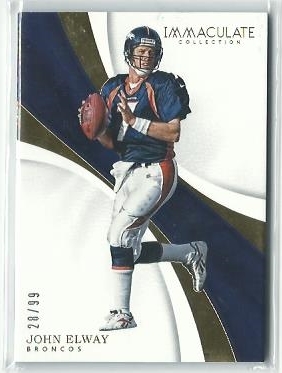 As for the Ed McCaffrey Certified Champions...it doesn't fit my collection but I had to jump on it. There was a seller who discounted his port at 90% or some crazy amount like that..but his inventory was much more appealing than the typical sellers who do this. With very little time to ponder my purchases, I swooped in and grabbed all I could. The Ed McCaffrey was $0.65. Did you take advantage of COMC's end of year sale? Which teams are you cheering for this weekend? I think this is the first time that I'm seeing the Gallery of Heroes for football, pretty nifty, of course those seem to work for whatever sport. Love the Dickerson Optichrome too, I keep meaning to get one of those, but haven't so far. Haven't been spending much money on COMC lately. Been focused on eBay... but even over there it's been small pickups. I spent a lot of money over the holidays, so now I'm just catching my breathe. 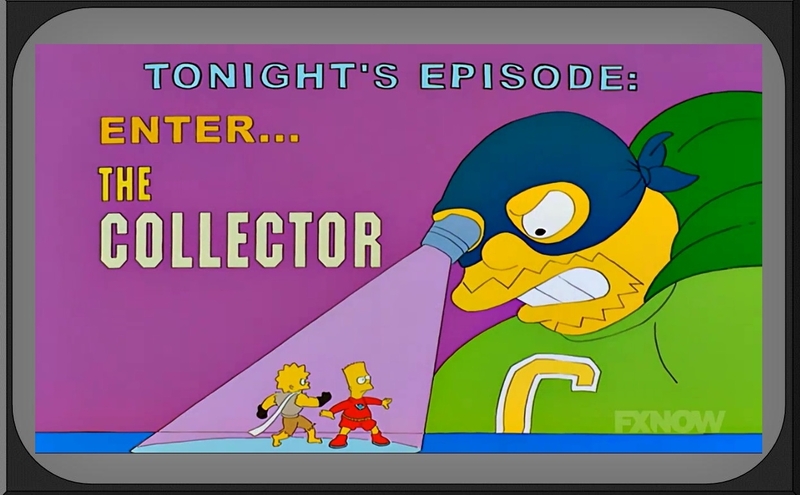 As for the games this weekend... the most important game is on right now. Hoping the Rams can hold off the Cowboys and make me a happy man.